I have generally always had a problem with discussions about what is broadly referred to as "Sin Nature." Rarely do people who use this term on a regular basis really seem to have a grasp of its irony. People are often too comfortable using this term to refer to "the way it is" and to what it means to be human. I think we far too often neglect the Imago Dei, the Image of God, in the conversation. When I was reading up a little and playing, as I often do, on Wikipedia (which, as a wannabe scholar, I must forbid) I found their wording to be just great: "Imago Dei... is a concept and theological doctrine" (although I would say it's much more) "that asserts that human beings are created in God's image and therefore have..." and here's the kicker... "inherent value independent of their utility or function." Man! Wouldn't it be great if we really allowed this "concept" to shape us? How would we see our own identity? Caught up in how we perform and measure-up or simply given to us as a gift, created in us? Our value is something over which we have no power and thus it is something we cannot diminish. God holds it and God refuses to let it be diminished completely. And this God who created within us that value, that image, meets us in the places where we are taken and where we take ourselves--places where value and image just seem impossible and invisible--and this God remembers us. God "remembered" Noah when the world was on its' way to destruction (Genesis 8), God remembered the people of Israel when their slavery should have made them invisible (Exodus 2:24), God remembers the Image created in us even when we are prone to forget it and to give up on it. Therefore, though the patterns of the world and the religious standards of righteousness continually seek to label us with and embed within us the name "sinner," and though sin tries to overwhelm our very nature, God continuously insists that "we are God's workmanship, created in Christ Jesus to do good works." God remembers the image he created in us and, through Christ, refuses to give up on it. Somehow God sees light in our darkness. The irony of the term "sin nature" is in the fact that our nature is not sin. It is because our nature--that which was created in us--is to do "good works" that sin is what it is. What makes sin sin is that it is against the nature which God placed in us, it is contrary to the Spirit of God which gives us breath, it is against creation and thus sin leads to destruction. No story captures the destructiveness and the anti-creation-ness of sin more vividly than that of Noah and the deluge. Sin came into the world and systematically dismantled the creation God had created and of which He said "it is very good." But God interrupted the story, remembered the Image which was created in us, and began his work of restoration. Sin is not our nature, rather sin is that which distorts our nature. Our nature is to live in harmony with God and with others and sin distorts our relationship with God and with others. Thus "sin nature" ironically communicates an oxymoron. I think that Paul, unless he had a very different understanding of the word "nature," held this irony within his perspective. What he's observing is sin's ability to inhabit our hearts and hijack our identity. But he is not saying that the Image of God has been destroyed to the point that our only hope is to escape creation altogether and hope that God will make us something we are not. I just read, on the back of John Ortberg's new book The Me I Want To Be, a great phrase which read, "God wants to redeem you not exchange you." He wants to redeem the good, his Image, within you not exchange it for a whole new and different one. "...all things are good even if they are corrupted. They could not be corrupted if they were supremely good but unless they were good they could not be corrupted... if they were not good at all, there would be nothing in them to be corrupted... all that is corrupted is thereby deprived of good. But if they are deprived of all good, they will cease to be... So long as they are, they are good. Therefore, whatsoever is, is good." If we are still here, if there is still breath in us, then we cannot be reduced to total corruption. For according to Augustine, if something exists it is good. It's not that everything that exists is as it should be, but it remains good nonetheless. For Augustine, evil had no substance of its' own, it was not created, it does not belong. Evil then, is not a force which imposes itself upon good but it is the state in which good things find themselves when their interactions become corrupted. "For in him we live and move and have our being" (Acts 17:28). Our very existence is testament to our having been created in God's image and to our having God's image still residing in the core of our being. 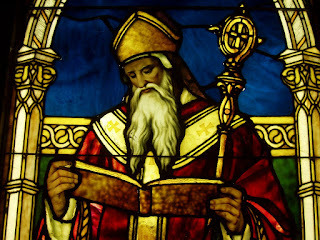 Augustine continues, "...each by itself is good, and the sum of all of them is very good, for our God made all things very good" (see Genesis 1). God's image is still within us and it shines froth from us, sometimes only visible in God's sight, through all the muck of sin that we place in front of it. So What does sin do to us if it does not destroy the Image of God within us? Well we don't just become sinners at the drop of a hat, rather we sin until we become sinners. Through habitual disobedience and through influences which coerce our ability to will the good, sin enters our identity and makes us something we are not. It manipulates us and God's Image within us so that rather than embodying and reflecting our Creator's goodness we reflect destruction and despair. One theology student put it well, "you get up early every morning until you become an 'early riser.'" What was once something you did, an action you performed from a different point of reference, becomes the point of reference itself. It becomes ingrained within you. Sin has a way of doing the same thing. Whereas we were created to do good works so that we would eventually become good workers, we walked a different path. We sinned, we hurt ourselves, we accepted the identity imposed on us by others, we allowed the world to trample us, we used religion against God, and we corrupted creation until we became sinners. What Christ does, what justification is all about, is remembering the Image of God. He puts us back at the beginning of the fork in the road, restores in us our vocation of good work and empowers us to do good works until we become good workers, to live in joy until we become joyful people, to make peace until we become peacemakers, and to love until we become lovers. Christ, the one who never gave in to the temptation of sin and who refused to see us as "nothing but sinners," restores the Image of God within us. One rule by which I try to live is this: never use a Disney movie as a theological illustration... I am about to break that rule. 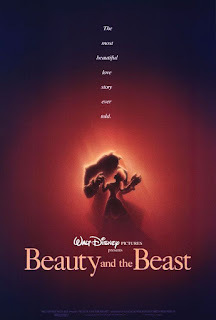 In Beauty and the Beast (which really didn't start out as a Disney Movie, but who can help but think of Belle in a yellow dress talking to candlesticks and clocks? ), there is a beast living in a castle, separate from his community, feared by them, and banished. His relationships have been obviously corrupted. The world refuses to see in him any image of what he once was. They see him as "nothing but a beast." But a pure-hearted young lady finds herself trapped in his castle. At first she is frightened by him and can't see any good in him. But when she puts in the work of actually getting to know him, she starts to see in him something good. She eventually refuses to see him as "nothing but a beast." She sees in him and image worthy of restoration. Yes, with every snarl and with every growl the beast reflects his corrupted state. But the woman stays with him and affirms his humanity even though, to any other eyes, none remains in him. Past the condemnation of the townspeople and through the claws and the fur, the woman sees the image of something beautiful. And although corruption had threatened to destroy him forever, love saves the day and restores the image within him. He is restored to his true and unadulterated identity. With every sin and every failure, indeed with every self-loathing act, we reflect our corrupted state. We show our inadequacy. But there is a God who stays with us, who has put in the work of getting to know us, who sees something worthy of redemption in us, and who lovingly saves the day. It is now our task to stay with the world, to bear with each other, as God has in Christ. We must be the Body of the very Christ who refuses to see people as "nothing but sinners." And thus we must refuse to see people as "nothing but sinners." Jesus said "love your neighbor as yourself." See in your neighbor the image that God sees in you, past the sin and past the signs of corruption. Jesus said "love your enemies." See in your enemies the image of the God who forgives and who has forgiven you. Mirror God's saving work and offer it to others, even to those in whom you cannot see the image of God. "Whatsoever is, is good." Whoever stands in front of you is created in God's Image and is therefore worthy of salvation because God's love makes them so. Bear with each other and forgive whatever grievances you may have against one another. Forgive as the Lord forgave you" (Colossians 3:13).